A band originally pieced together by vocalist Chris Bay and drummer Dan Zimmermann back in the late 90’s, Freedom Call have subsequently gone on to establish themselves as one of the premier melodic power metal acts in the business. Steeped in the finest traditions handed down to them by the perennial favourites Iron Maiden, Helloween, Blind Guardian and Gamma Ray, over the course of half a dozen studio albums and a couple of live releases they’ve developed a strong identity all their own, in the process winning an army of loyal supporters right across mainland Europe and beyond. Having been unable to tour with the band since 2007 because of ongoing commitments with Gamma Ray, Zimmerman has finally hung up his sticks in the studio too; seventh album ‘Land Of The Crimson Dawn’ therefore sees the debut of new drummer Klaus Sperling (a name that should already be familiar with fans of Sinner and Primal Fear). Taking its lead from the slightly darker direction explored so successfully by predecessor ‘Legend Of The Shadowking’; whilst not a concept album as such, the lyrical theme on ‘Land Of The Crimson Dawn’ nevertheless sees the band explore different facets of that ever more pervasive bane of modern living ... cyberworld. 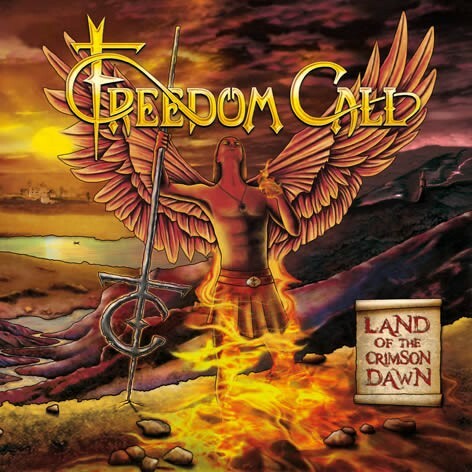 Looking at this from a purely musical perspective I’m pleased to report that this is classic Freedom Call – galloping rhythms, strafing guitars, crescendo driven choruses and baroque melody structures all distilled together and presented in equal measure. Punctuated continually with an ever changing variety of moods and tempos and hard wired with some of their most ambitious sounding arrangements to date, tracks such as ‘Back Into The Land Of Light’, ‘Age Of The Phoenix’, ‘Crimson Dawn’, ‘Eternity’ and ‘Valley Of Kingdom’ hit hard and they hit fast, indelibly imprinting themselves on your subconscious mind from the opening riff. Yet from time to time they happily throw in the odd curve ball – the Celtic ambience of ‘Sun In The Dark’ an obvious reference point – which serves to enhance and accentuate their work. Technically speaking the quartet sound as tight as ever, Sperling connecting seamlessly with bassist Samy Saemann to lay down an immovable bedrock of sound from which Bay and guitarist Lars Rettkowitz launch their neo-classically infused aural assault. And talking of Rettkowitz, whilst his talents tend to get glossed over in this particular field (especially when compared to some of his higher profile colleagues), he sounds better than ever on these new tracks, his swingeing riffs and explosive solos commanding the musical high ground from the off. Released as either a standard 14 track CD or a special edition digipack (containing a bonus disc with six Freedom Call favourites performed by artists like Powerworld, Secret Sphere and Manimal), this is yet another step in the right direction for a band who have gotten consistently stronger since day one.